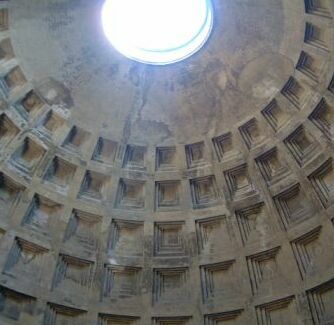 The Pantheon was initially built in the first century BC, dedicated to the planetary gods. 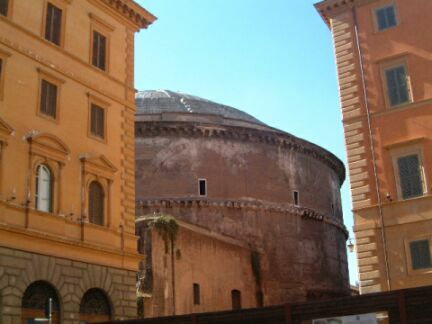 But the great rotunda (Dome) was later built by Hadrian (AD 118-128). The diameter of the dome is greater than that of St. Peter's (42.5 m) and remained unsurpassed until Brunelleschi's dome at the Florence Cathedral of 1420-36. 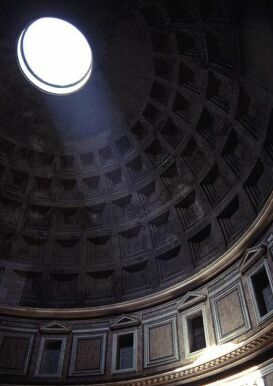 Most modern critics still attribute the design of the Pantheon to one of the world's greatest architects. Through great bronze doors, you enter one great circular room. The interior volume is a cylinder above which rises the hemispherical dome. 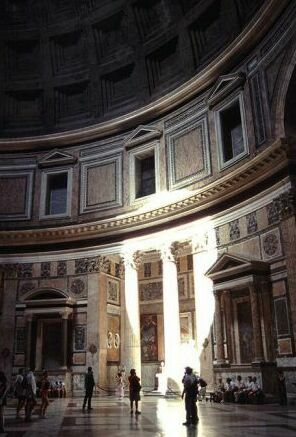 There are no artificial lighting, only natural light (sun) enters through an unglazed oculus (a circular opening at the dome) at the center of the dome and through the bronze doors to the portico. As the sun moves, striking patterns of light illuminate the walls and floors of porphyry, granite and yellow marbles. 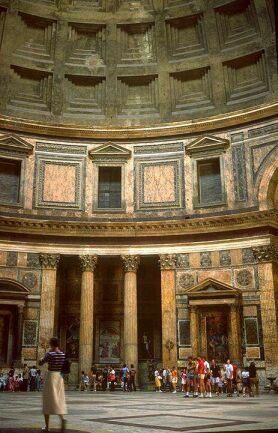 The floor of the Pantheon is slanted to let rainwater drain from the building. 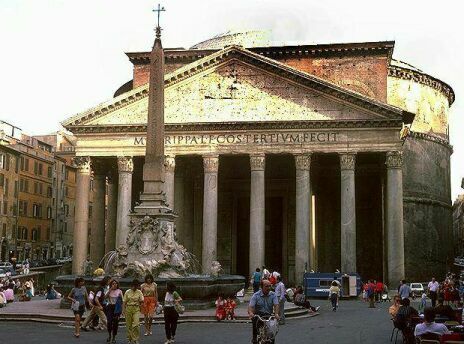 The bronze doors of the Pantheon are among the few bronze doors from Roman times that have survived although they have been restored a number of times. The purpose of the oculus was not only to illuminate the interior but it was also built to let those in the temple contemplate the heavens. The dome is constructed of stepped rings of solid concrete with less and less density as lighter aggregate (pumice) is used, diminishing in thickness to about 1.2 m (4 feet) at the edge of the oculus. The dome rests on a cylinder of masonry walls 6 m (20 feet). Originally, these exterior walls were faced with colored marbles. 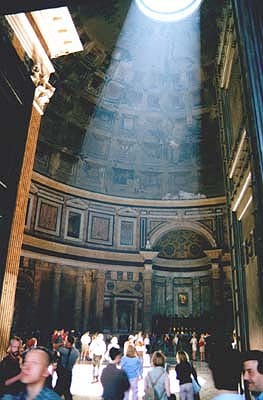 A view of the inside of the Pantheon. Note how small people are next to the grandiose columns. 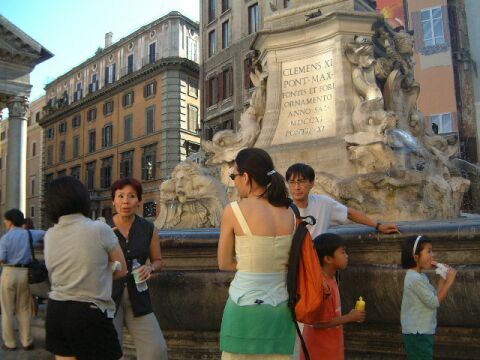 The fountain outside the Pantheon. 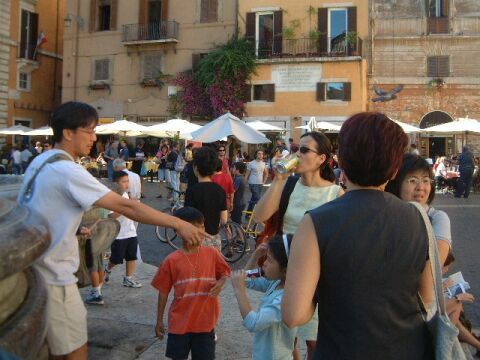 Catching up with our tour guide.